If you have a clear idea for a book, article, or blog series that relates to your business or personal life, but don’t have enough time, writing skill or confidence to turn your idea into a marketable manuscript, consider contracting with a writer-for-hire. A team approach allows both “creators”—the legal author and the writer-for-hire–to display their complementary strengths while collaborating on a written work. That’s where a publishing consultant or literary attorney comes in—an experienced publishing professional will ask the questions that lead to a satisfying contract for both parties. A good contract does more than just recite a price and time period for completing a literary work, including blogs or magazine articles. Similar to a good business plan, a writing contract should give both author and writer-for-hire, and this includes ghost writers (whose names are not included under the by-line), the structure they need to reach their common goal. Do you have a production schedule for various phases of the writing process—e.g., a proposal, an outline, chapter segments and drafts? If you disagree with your writer (or the writer with the author), how will the two of you resolve the conflict? Will one of you need to travel in order to meet with the other or can you communicate by phone? What costs are associated with the project and who will pay them? 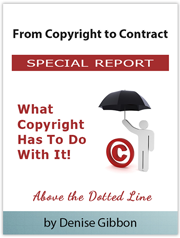 There is particular language that the work-for-hire contract must include to make it clear that the author is the copyright owner—has it been included? Will the writer share credit for the book, be a “ghost” or only mentioned in the acknowledgements? Most important, what happens if the relationship doesn’t work out? Is there an escape clause for the writer as well as the author? Writing “with” is a business, but there are personal considerations to keep in mind. If you’re the author, does the subject matter require that you give the writer access to private diaries, letters, and emails? If so, include a contract provision requiring the writer to maintain your confidentiality except with regard to the passages you agree to include in your work. Most professional writers want this kind of provision in a contract because it protects them as well. Stick with what you do best—telling your personal story, expressing your unique vision about your hobby, life journey or profession, or giving others a new take on life–and let a professional write it down. And when it comes to creating a contract between author and writer, do that with a professional, too.